The day after UK judges declared Apple’s “apology” on its website was a “breach of the order”, the Cupertino company removed the “non-compliant” post and published the first newspaper adverts to comply with the court’s ruling. 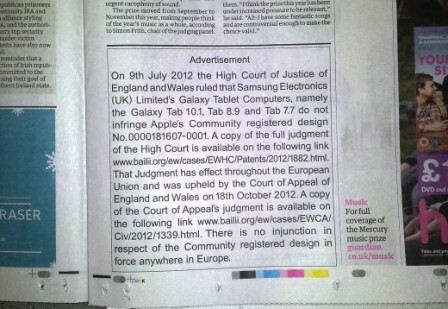 The Next Web has spotted Apple’s revised advertisement in this morning’s Guardian. The advert includes the same statement the company posted on its website, except the comments that caused yesterday’s hype surrounding the notice. As noted by Matt Brian, the advert seems to be printed as requested by the original ruling: 14 pt Arial font. 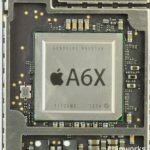 Apple received a 24-hour deadline to remove the notice, as its request for a 14-day delay was rejected. As of this morning, the post is no longer available on the website, but Apple needs to update the Samsung notice on the front page of its main, Apple.com website within 48 hours. The notice needs to be printed in 11 pt Arial font. Although we don’t have information about when Apple’s website will be updated with the revised notice, stay tuned — we’ll keep you posted.